To crush a bunny chow…. For heaven’s sake, we are not cooking up a bunny rabbit! It’s a Bunny Chows and almost like traveling back in time…you have to take a trip down memory lane….so how do you describe eating a bunny….is it to eat a bunny? No! Everyone has their own terminology…to kill a bunny….to crush a bunny or to slay a bunny but there is never any cutlery! Indian fast foods have a story behind them….and bunny chow was a way of serving curry in hollowed out bread that didn’t need a plate or cutlery…it was borne in times of hardship, racism and apartheid. The best ‘Durban fast food’ was the result of those difficult times so yes, while we now live in a generation of born free’s, the bunny chow movement is still going strong! When I think bunny chow, I think Island Hotel in Isipingo Beach! My Nan’s sister, Phyllis owned the Island Hotel…well, it was owned by the ‘B V Naidoo’ clan that owned the hotel. Strangely enough, the Andhrite community still speak of clans! I do find it quite amusing…what if you just don’t have a clan or fit into one either? I was never a fan of the chicken bunny….give me a good old bean bunny or my other bestie, the famous lamb bunny. We loved visiting Granny Phill! She was always feed us…making sure that we were over fed and cheerful when we left….and definitely in need of an arvie nap! She would cook up large batches of curries in massive pots…the cooking gene runs deep in our family! Granny Phyllis passed away a few years ago…but she has left some beautiful food memories behind….we would smell the curry in the car park of the hotel and we knew that she was around! She cooked with love and hearty…a larger than life personal with a sense of humor that just made us giggle! There is just something about pickle…it has a magical ability to get out of the bottle! Maybe, it’s just too delicious to stay in a bottle! So, here is a great way to use of those delicious bits of pickle masala….just pop a few scoops into your curries…it works well with paneer, chicken, seafood and lamb….my favourite is the lamb curry! I also add some ‘home made fat chips’ to my bunny. I squish the chips on top of the curry and then spoon more of that pickle masala sauce on top just to make it a super treat! It’s also one of my favourite fix it ingredients….if the curry just needs a bit of ooooommph, add a scoop and it will remedy a bland curry transforming it into a magical one! I use lamb shanks or knuckles for this curry…I don’t enjoy the texture or flavour…maybe, I should say lack of flavour in leg of lamb so although it is boneless, it falls short on flavour! I pop up to our local….the Broadacres Superspar and get Mr Pat to prepare the lamb cuts for me! He is brilliant and one of those old school ‘blockman’ or butchers! On his recommendation, I have tried a combination of knuckles and shoulder which I must say resulted in the tastiest curry ever! Shoulder would be just a little too bony for a bunny. 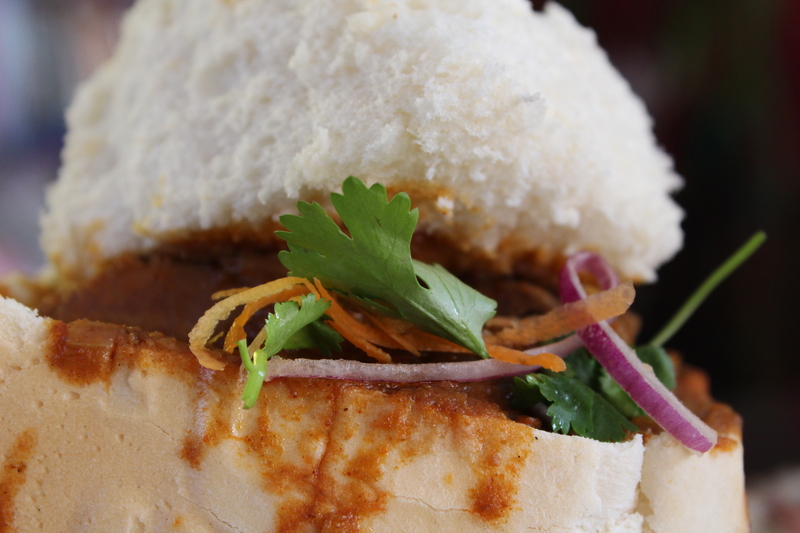 If a bone finds its way into your bunny chow….just keep going! Your fingers are going to get messy anyway so it’s not a train smash! 2. Only share a bunny with someone you know….it would just be weird to eat a bunny with someone you didn’t! 3. No bunny chows on first dates – save that for maybe the second! 4. Soft drinks work best with a bunny…I mean really, who ever drank red wine or champagne with a bunny…and fruit juice is just as bad! 6. Need to rinse your fingers after an ‘outdoor’ bunny feast….use the windscreen washer….works perfectly every time! Heat the oil in a large AMC pot. Fry the cinnamon sticks and bay leaves. Add the onion, sprinkle in the salt and sauté until the onion is light golden brown. Add the ginger and garlic, stir for a few seconds, then add the red chilli powder. 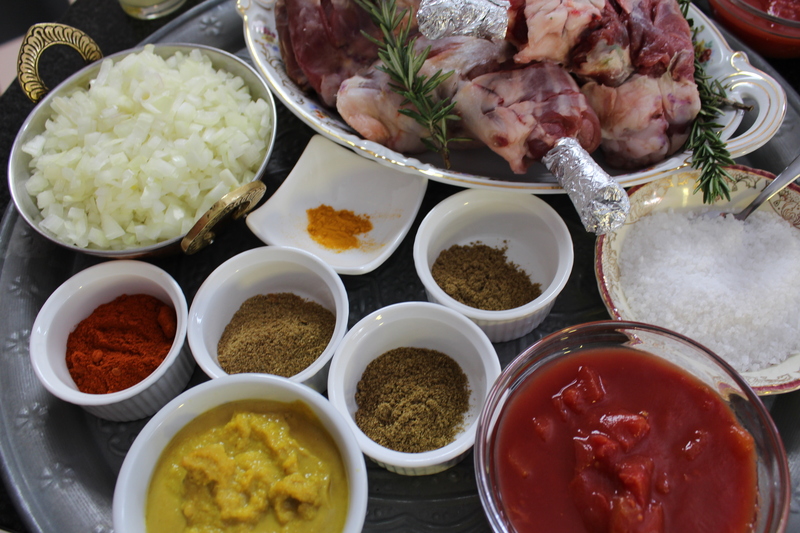 Place the lamb shanks into the pot and coat in the spice mix. Pour 500ml boiled water into the pan, then add coriander, cumin, garam masala and turmeric. Simmer until the meat is tender and starts to leave the bone – you may need to add more water if necessary. Remove the shanks from the pan, and place on a chopping board. Leave to cool slightly, and debone the shanks. Discard the bones. Add the tomatoes to the sauce and once they soften, add the deboned lamb. Stir the pickle masala into the lamb and simmer for a few minutes. Slice a loaf of bread in half and hollow out the soft inner, leaving the crust intact. Spoon the lamb into the bread and then top with coriander and freshly made potato chips. Spoon more sauce over the chips and serve.